I love to find fresher, lighter preparations for some locally available vegetables, a refusal to believe that we just don’t have that many vegetable-based dishes in our repertoire in the Philippines. Recent data suggests that as a nation, we consume a phenomenal amount of meat, and that’s odd given the region’s seeming love affair with not only delicious, but economical and healthy vegetables and herbs. I am a carnivore, and couldn’t be otherwise, but I do love my vegetables and salads. 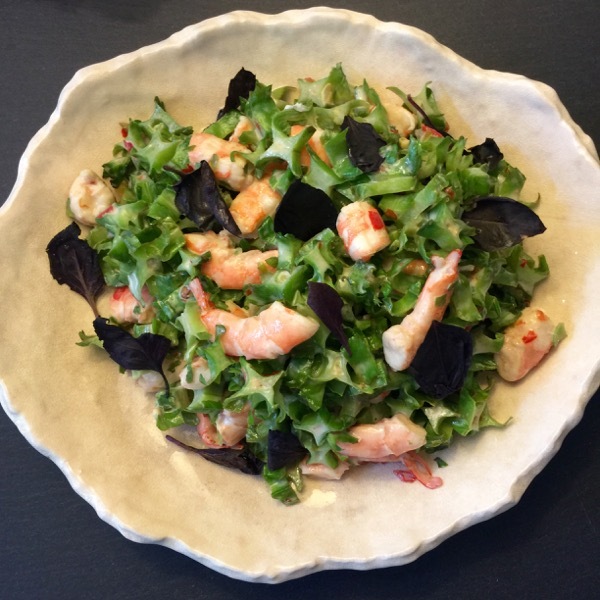 This one experiment, a variation on this thai dish, is different enough, delicious enough and unique enough for me to cheekily add “a la Marketman” to it’s name. Start with beautifully fresh sigarilyas or sigadilyas (winged beans) and cut them to small pieces and blanche in boiling water for a minute or less and shock in ice water to stop the cooking process and retain that vivid green color. Steam or blanche some shrimp until just cooked and peel and devein if necessary. Make a dressing by adding fish sauce, fresh lime juice (dayap), some sambal (not too much) a touch of homemade tamarind puree, a touch of brown sugar and mix until dissolved. Toss the vegetables and shrimp with the dressing, and add a couple of tablespoons of coconut cream just to mute and balance out the flavors. Taste and adjust as you desire. At the last minutes, I spied the preserved limes in the fridge so I added a scant 1/4 teaspoon full of finely minced lime rind (no pulp) to the dressing. Chill for a few minutes in the fridge as the flavor meld together. Serve slightly cool. I added some purple basil for color but they were irrelevant. This salad was FANTASTIC. The little bits of powerful flavor from the preserved limes really provided an unusual punch. The whole thing just worked really nicely. Mrs. MM and I nearly finished this entire salad, and it was quite large. We left some on purpose so the crew could taste it and replicate it for future meals. It’s not really a filipino dish, but who cares, it tasted wonderful. Any reason to use more veggies and get us all eating them is a good one, as far as I am concerned. Old post on sigadilyas, here. And here’s an interesting take on “Bicol Express” with sigadilyas. Wow sarap! This post brought back memories when I was growing up on a farm in Bulacan. We put sigarilyas on top of steaming rice, 8-10 minutes before the rice is fully cooked. We ate it with binagoongan, milagrosa rice and fried fish – – yummy!. I agree and hypothesize perhaps it may be a regional difference. Growing up Illocano-American, many of our meals were dinengdeng of whatever grilled fish from the night before then transformed into another dish supplemented by whatever vegetables were on hand. Sigarilyas have been appearing in our local Silicon Valley farmers’ markets along with malungay leaves and pods. Wing beans are also great with roasted spicy grated coconut and beansprouts. 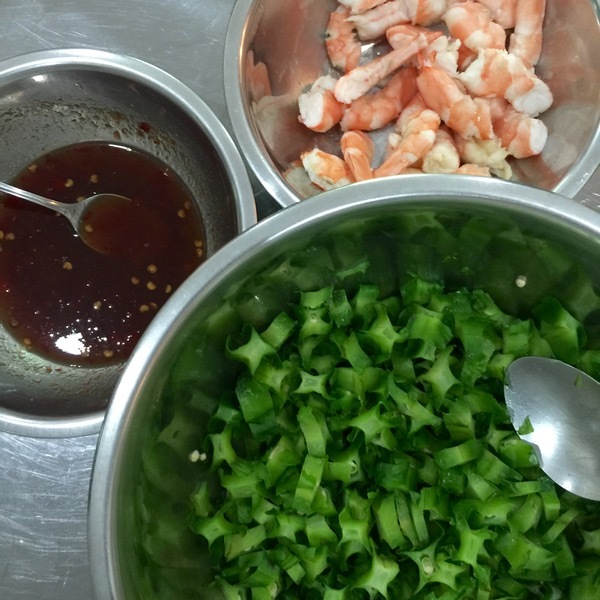 No shrimp needed but up the ante with the sambal, limes and fish sauce. Ground roasted peanuts and roasted sesame optional. Khew, oh, that sounds GOOD too. I think the unique firmness and structure of the wing bean means it has crunch, tenderness, and nooks and crannies for the dressing or sauce to hide in. It’s definitely a favorite of mine recently. I noticed that you used purple sigarilyas in a past post. I’ve never seen them in the markets before but I just feel that any purple fruit or veg must be full of those healthy anthocyanins, the powerful antioxidant that confers superfood status to some produce. Mangosteen and ube must also be filled with this wonderful beneficial ingredient. It looks crisp and refreshing. Very filling and low cal. The dark purple basil jumped at me at first like flakes of truffles which can redeem any dish of hopeless veggie. Winged beans occasionally show up in the markets here along with other exotic fruit such as atis, calamansi and lazones, flown in from somewhere in the world under tropic clime. Understandably not at peak condition and always exorbitantly priced so I eschew them except calamansi which knows no substitute for squeezing over any type of pancit. Those sigadilyas are so beautiful! 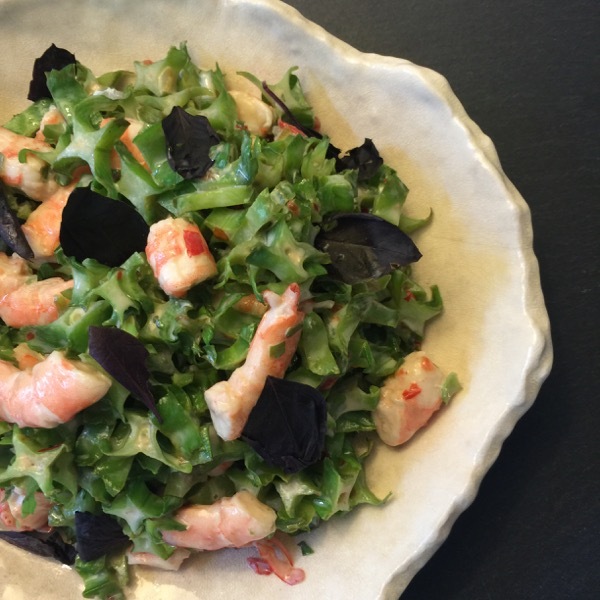 I always love a salad, and this one sounds delish with the added shrimp and coconut cream. Yum!! Now I know how to use sigarilyas besides putting them in sinigang or as plain vegetable saute	. From a household that only knew sigarilyas through eating it ginataan style, they were happy to eat the sigarilyas salad I made before. The dressing is the similar, very thai in flavors. I am only recently learning the “Filipino” way of eating leaves (like camote tops, sayote tops, alugbati, etc) which is mostly lightly sauteed. I used to do “American” salads more before until I realized that the dressings that I liked wasn’t altogether healthy, since I hate vinegar hence vinaigrette. Thai salad dressings on the other hand, are more on citrus, which I love. I read somewhere that sigadilyas/sigarillas/winged beans are the most nutritious legumes. Power Mac Center, Was Lying Really Necessary?? ?